2015 saw Tokyo sweltering under a record-breaking eight consecutive days of extremely hot days with highs passing the 35°C mark. Temperatures may be even higher by the time of the Tokyo Olympics in 2020. Being a global issue, climate change is a major threat, and an obstacle to maintain a sustainable society. The increase in greenhouse gases such as CO2 is considered as one of the causes of climate change. Emissions of greenhouse gases in Asia, which is undergoing remarkable development, are seen as a particular rising issue; therefore efforts taken to reduce these emissions are an urgent necessity. Beginning with the Kyoto Protocol in 1997, Japan has provided numerous proposals and initiatives for creating a low-carbon society. Taking the “know-how” knowledge accumulated in Japan; improving it and implementing it in developing and emerging countries in Asia has the potential to curb global warming and avoid the risk of various natural disasters. 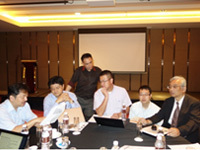 The aim of this project is to produce scenarios for the creation of a low-carbon society using Malaysia as the model. Comprehensive research will be conducted from all angles with the aim of producing scenarios that reflect the wishes and hopes of the many people living in Malaysia, as well as curbing greenhouse gas emissions. After attending the doctoral program at the Graduate School of Engineering at Kyoto University and receiving his doctorate in engineering, he served as professor at Nagoya University’s Graduate School of Engineering, and went on to assume his current position in 1998. Served as program leader for Kyoto University's Global Center of Excellence Program "The Global Center for Education and Research on Human Security Engineering for Asian Megacities" from 2008 to 2013. Specializes in integrated assessment modeling of climate change problems. After completing the doctoral program at Toyohashi University of Technology's Graduate School of Engineering, and receiving his doctorate in engineering, he served at Universiti Teknologi Malaysia as lecturer, and later associate professor, and assumed his current position in 2007. He also serves as director of Relations at the Office of International Affairs. He specializes in studying low-carbon society scenarios and environmentally-conscious urban planning. Aiming to mitigate climate change through Japanese leadership. Achieving low-carbon societies is the most important issue for the world in the 21st century. In order to resolve this issue, we must consider long-term countermeasures spanning over a decade in a wide range of fields, including energy, industry, commerce, agriculture, and transportation. In conjunction with these measures, the reduction of greenhouse gases being emitted must be carried out while keeping in mind the outlook for social / economic development. Japan itself has just begun creating a comprehensive plan towards a low-carbon society. However, in order to aim for a low-carbon society and mitigate climate change, it is important to build a cooperative framework on a truly global level, not just in Asia. Japan intends to take the lead in this; as a start by conducting collaborative work with other regions in Asia. We would eventually like to encourage initiatives aimed at creating low-carbon societies that are implemented simultaneously throughout the world. We feel these activities are very significant in increasing Japan's contribution towards mitigating climate change. Aiming for a low-carbon society in collaboration with Japan. Malaysia, one of Southeast Asia's leading developing nation; is currently undergoing rapid economic development. For example, we aim to more than double both the population and economic activity of the Iskandar Region over the next decade. On the other hand, we also have the aspiration to achieve a low-carbon society. In accordance to this, we have been trying to understand what it would mean for this region and nation to achieve both a low-carbon society and economic development that work hand-in-hand towards managing the rising climate change issues. We have great hopes for this project, in which we will explore these issues in collaboration with Japan. Research is being conducting on two types of scenarios for achieving a low carbon society, one focusing on Malaysia as a nation and, the other focusing on the Iskandar Region which is located on the southern tip of the Peninsular Malaysia. With the Malaysian government making a particular effort to promote economic development in the Iskandar Region, the population and economy of the region are expected to see major growth in the future. How can greenhouse gas emissions be curbed without hindering economic growth? The synergy of Japanese technology, experience, knowledge and ideas together with the Malaysian scenario, culture and skills are required in order to answer this question. Interview people in Malaysia and the Iskandar Region and identify what their idea of an ideal lifestyle and society is and, what is their understanding towards a low-carbon society. Represent these ideas as a vision for the low-carbon society that people are aiming for. Develop individual measures for reducing greenhouse gases in various areas; such as power generation, industry, traffic, transportation, commerce, households, and land use. Propose these measures which can be implemented to localities after careful consideration, analysis and, taking cost-effectiveness into account. Draw up a concrete action plan, considering when and how current social and economic systems will be transformed towards achieving a low carbon society. Then work out the time line as to which measures need immediate implementation, short-term and long-term implementation consideration. The low-carbon society scenarios must in accordance to Malaysia's economic development. The scenarios proposed will be applied to the region various sectors and implemented in real-time by the localities to their best effort. The scenarios which are successfully implemented will be methods which enable the development of a low-carbon society using Iskandar Malaysia and Malaysia as the model region and nation. With these examples, we will go on to target other developing nations and emerging economies in Asia towards achieving a low-carbon society. These methods can then be implemented in other Asian countries taking into consideration the nation’s growth, economy, society and targets; this will put us on track towards the goal of reducing greenhouse gas emissions throughout Asia. What concrete steps should we take to reduce greenhouse gas emissions? There are 281 programs that have been proposed in twelve sectors, which including transportation, industry, systems, architectural structures, energy, lifestyles, environmental education, land use, and waste. Here are some examples of programs in the transportation sector: bus routes and bus arrival information systems, high-speed railways and smooth connections between modes of transport* can be established, and various means of transportation demand management** can be adopted. Also included are educational programs for schools and programs for setting up systems to smoothen the acceptance of these measures by the general public. * Modes of transport: Methods of transportation, such as by road, rail, water, and air. ** Transportation demand management: A means of curbing or regulating the amount of traffic by methods such as changing how automobiles are used. How are the targets for greenhouse gas reductions set? How are they calculated, and what data are they based on? There were two main basis used to set our targets. Firstly, the target is set considering the Malaysian nation target which was set when the Malaysian Prime Minister Najib Razak declared at the 2009 COP (Conference of Parties) in Copenhagen that Malaysia would cut its carbon emission intensity (ratio of emissions to GDP) by 40% by 2020. Iskandar Malaysia Region adopts this as a target because, it being a development region within Malaysia, serving as a model, and representing Malaysia this target must be achieved. Secondly, we consider what reductions can be made. This is in co-relation to the programs proposed within the region as concrete steps. The calculation of reduction of the greenhouse gasses are done through a set of processes. We first estimate if a specific measure is able to be implemented or not; for this reason we confer with the various stakeholders of each sector within the region through workshops, focus-group-discussions and other means of communication. As a result of these discussions, we were able to develop and implement 281 programs in various sectors. From the programs implemented, we select the programs that contribute a potential of emission reduction. We then add together the potential of emission reductions based on forecasts for things such as the regional society, economy, industry, transportation, agriculture, and land use. Following this, we then estimate the amount of natural energy resources and the amount of energy to be recovered from rural and urban waste. As a result of our estimation; the calculation for the amount of emissions that can be reduced by taking these measures revealed that the Iskandar Region would result in a 40% reduction in emissions in 2025 compared to a business-as-usual case in which no special measures are taken. In terms of carbon intensity, this would be a 58% reduction compared to 2005 levels, which was considered comparable to the national target, therefore we set this as the target for emission reduction. What kind of things should we keep in mind in order to achieve a low-carbon society without hindering economic development? The Iskandar Region is currently aiming to switch from an industrial structure which is centered on the petrochemical, food processing, and electrical / electronic industries, into an industrial structure with low Carbon dioxide (CO2) emissions but has a high value add; such as finance, creative, healthcare, and education industries. Much of this will entail new investment in manufacturing facilities and social infrastructure, so it is thought that a major contribution will be made to economic development by proactively and purposefully establishing the latest energy-saving / low-emissions facilities and systems. However, in order to do this, we need frameworks and information systems that force us to take a long-term perspective and consider the effects on the entire region, rather than on individual businesses and groups. 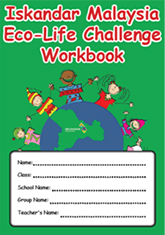 Since it is also important for people to have an awareness that encourages this, there is a need for environmental education in schools and society. It is important that this system be designed rationally, rather than in an uncoordinated fashion, and for it to fit together efficiently. If not, we will fail to create a society that is agreeable to both the environment and the pocketbook. People say that achieving a low-carbon society will lead to the resolution of environmental issues like air pollution. Please explain. The cause of air pollution is emissions of pollutants from the likes of automobiles, factories, and power plants; much of which results from burning fossil fuels. However, as we aim to achieve a low-carbon society, the burning of fossil fuels will be reduced as much as possible, which, in many cases, will also mitigate air pollution. This involves the way society works, so the leadership of the Malaysian government is important in this regard. How are you working with the government? Project researchers in Iskandar holding the 11th progress meeting.Government leadership is essential for the implementation and success of this project. For that reason, collaborating research partners include authorities in charge of developing the region and departments and agencies in the central government in charge of national land development. They will also become key implementers of the proposed plan. The creation of scenarios for a low-carbon society is based on a method called backcasting. In the backcasting method, you visualize an ideal scenario in the future, and then plan from that future scenario backwards to the current scenario, consider what you should do now in order to make that future scenario a reality. This way of conceiving things is vital when creating a sustainable society. Please see the project’s webpage for details.